The seemingly interminable Aaron Rodgers collarbone saga makes it impossible to determine much about the Bears-Packers game itself. 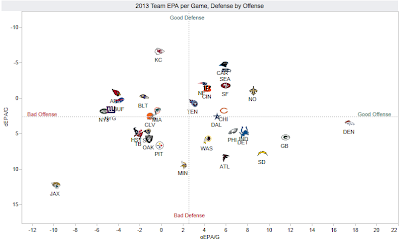 With a reasonably effective Rodgers, it's quite clear Green Bay is the better team. Chicago's defense is arguably the worst in the league when the turnovers dry up, and Jay Cutler has been a sub-replacement level quarterback since his return from a groin injury. Unfortunately, the flip side to that Broncos comparison means that the Packers had a below-average defense, and the unit has only gotten worse throughout the season. Injuries haven't helped this already thin unit. Clay Matthews has missed four games and looks like he may not play this Sunday. Casey Hayward, arguably the league's best slot corner, played just three games this season before going on injured reserve. Johnny Jolly, the team's second-best front-seven player in terms of EPA per play, is out for the year as well. Rodgers' potential return would give the Packers a much higher offensive ceiling than the Bears, but they would likely have to fulfill that potential to make serious noise in the postseason. As things are, an incalculable amount of ink and bandwidth has been spent on a player who might not even suit up. That's a shame, because the Packers were once destined to join the Eagles as fun uber-efficient offenses with legitimate chances to crash the Super Bowl from the wild card round. The Ravens and Dolphins are an uninspiring duo, but one of them is likely to capture the AFC's final wild card slot. Both squads are deeply flawed, and a Ravens-Colts, Dolphins-Colts or Dolphins-Bengals game would heavily favor the home team. The Chargers and their polar opposite offensive-defensive profile would be next in line if both Baltimore and Miami falter. However, it's the team after San Diego that would probably provide the stiffest competition if given the chance. The Pittsburgh Steelers looked toast roughly 147 different times this season—after their 0-4 start, after sitting 2-6 halfway through the season, and after their devastating Thanksgiving night loss to Baltimore. 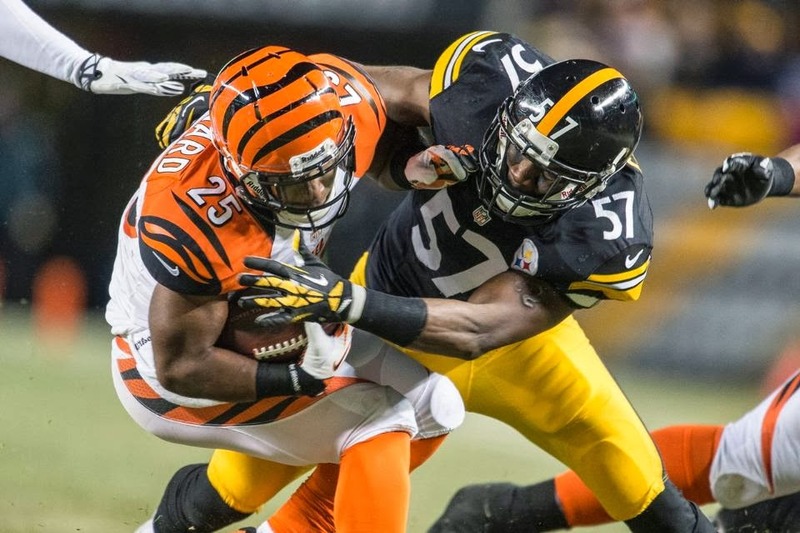 But Pittsburgh has righted the ship over the season's second half, and Football Outsiders sees the Steelers as a borderline playoff team based on their recent performance. Pittsburgh's weighted DVOA ranks 13th, ahead of AFC playoff locks/contenders Indianapolis, Baltimore and Miami. Alas, Pittsburgh is highly unlikely to see the fruits of their labor pay off this year; Football Outsiders gives the Steelers just a 9.1 percent chance to sneak into the postseason. Still, if Pittsburgh can receive continued development from their young contributors, their two-year absence from January football should end next season. - The Dallas Cowboys have wiggled their way up to the second-highest run success rate, with a 46 percent clip that trails only the Eagles. Regardless of whether Dallas starts a hobbled Romo or Kyle Orton, the ground might be their clearest path to an upset. It's a good matchup for them, as Philly checks win with a defensive run stop success rate of 56 percent, one of the ten worst marks in the league. Of course, the Cowboys are even worse defensively and facing an even better rushing attack, so they certainly will not be alone in running wild on Sunday night. - The Tennessee Titans have been a pretty "meh" franchise for a few years now, apart from a fun Kerry Collins-fueled 13-3 2008 season. 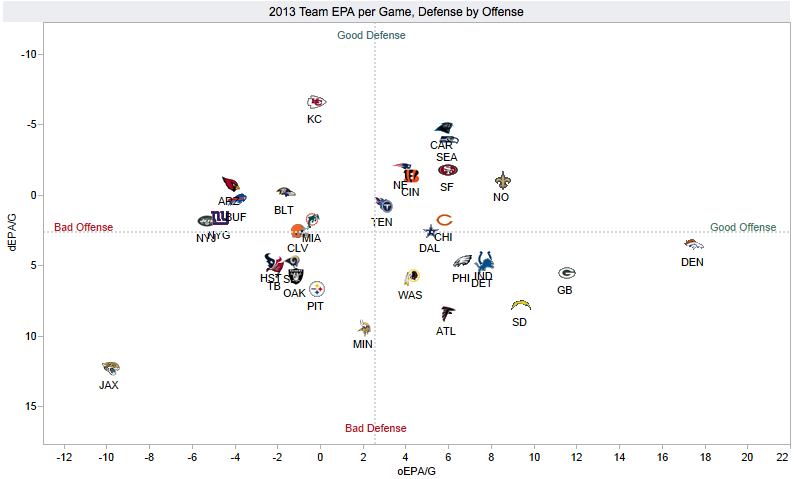 Perhaps fittingly, Tennessee is the closest thing to 2013's league-average model based on their efficiency ratings. Apart from slightly below-average offensive fumble and defensive interception rates, Tennessee is essentially right on the league-average button in every category. That's not really where any team wants to reside long-term, and the Titans can take a big step back by letting loose Chris Johnson and Jake Locker. The two are scheduled to earn a combined $31 million in base salary next season, and the Titans can save some money and finally redirect a flagging franchise. - When evaluating the Detroit Lions, many ascribed their 2012 struggles to a poor record in one-score games. The Lions finished just 3-9 in one-possession games last season; during their 6-3 start this year, they flipped that to a solid 4-2 mark. Alas, Detroit has now lost three consecutive one-score games in their six-week malaise, and have blown fourth-quarter leads in all five of their losses during that stretch. Intangibles like mental toughness and clutch play often get overstated, but it's fair to wonder if losing these games is really just a fait accompli part of the Lions' culture.